I've always been a big fan of the Meyers Briggs Personality Test because it does quite an accurate job of summing up the characteristics of the people I know who've taken it. For years my result always came out as ESTJ and I was fine with that. My husband (the eternal introvert) always strongly agreed with my assessment and the fact that I was an extrovert (the "E" of ESTJ) and I continued to believe this until I recently redid the test. To my surprise, the "E" had changed to an "I" and lately I seem to be ticking a lot more introverted boxes. This threw me a bit - and rattled my husband's cage a little too! He was still insistent that I was the extrovert in the family because I liked spending time with friends and chatting. What I've come to see though, is that as much as I enjoy the company of others, I also really enjoy time by myself. I'm just not a party person any more and if there is an excuse not to attend then I'll find it. I find large groups of people quite exhausting these days and much prefer catching up with one or two people at a time. Too much noise and too many conversations all going at once just seem to drain the life out of me and I end up with a headache and a sense that I didn't really connect with anyone on more than a superficial level. 1. I can perform tasks alone or in a group. I don’t have much preference either way. 2. Social settings don’t make me uncomfortable, but I tire of being around people too much. 3. Being the center of attention is fun for me, but I don’t like it to last. 4. Some people think I’m quiet, while others think I’m highly social. 5. I don’t always need to be moving, but too much down time leaves me feeling bored. 6. I can get lost in my own thoughts just as easily as I can lose myself in a conversation. 7. Small talk doesn’t make me uncomfortable, but it does get boring. 8. When it comes to trusting other people, sometimes I’m skeptical, and other times, I dive right in. 9. If I spend too much time alone, I get bored, yet too much time around other people leaves me feeling drained. I can tick every one of those boxes! So now I'm going to say I'm an ASTJ if people ask - I still have a lot of the ESTJ traits, but I think I might be mellowing in midlife! I think that just about sums up midlife for me Renee - and I quite like it! It's a good balance isn't it? I think that throughout life we are constantly evolving and changing. I have always been an introvert, but I am becoming a bit(granted just a little bit) more extroverted as time goes by. I only realized a few years ago this is precisely what I am. For me the biggest biggest part of it is I can do a lot of socializing and interacting but I absolutely positively must recharge alone. I just find socializing quite hard work these days Carla - I can do it, but it's certainly not my favourite thing! Oh, my goodness! This is me!!! This is me. I tire quickly of small superficial talk like the weather. I understand it is a ground breaker for many people to warm up their conversational skills but in my dotage I want to say "get on with it"! I am definitely an introvert. I hate social settings and prefer my alone time...although I haven't seen any for a long time Lol! Ambivert is a new one for me. I have never quite fit into either being an extrovert or an introvert. 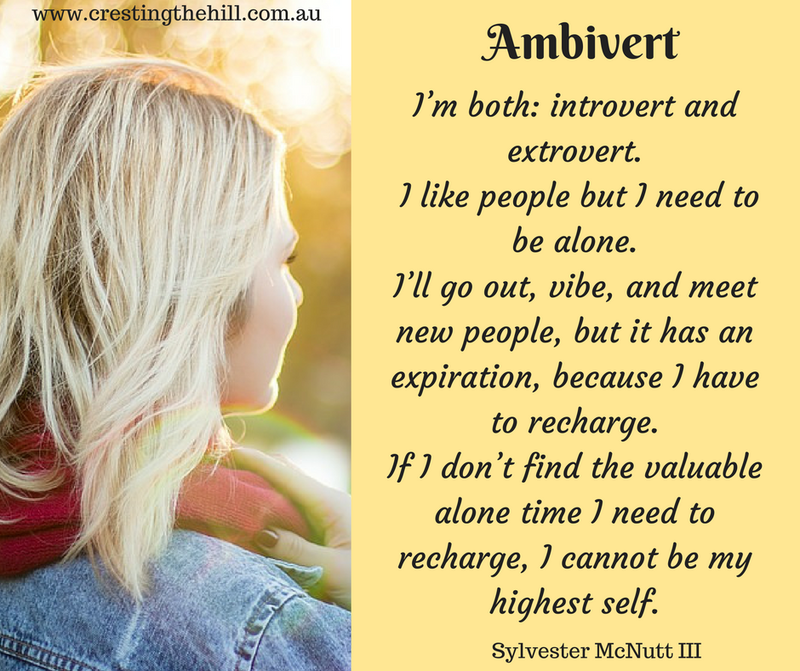 Many of the characteristics of an ambivert resonate with me, too. I'm a Certified Practitioner of the MBTI, and MB tells us that as we get older we use our other functions more and more. As we gain experience in life, we call upon all of our functions. It is really so interesting because I read an article that said that it is in our brain wiring to be either from birth but of course I am sure even that changes as we get older. I took the test too and I am 80% Introvert and looking back I've been such my whole life. The test is pretty accurate for me too Heidi but it changed over time because I think I am getting less tolerant of large groups and the effort involved in being part of all the social palaver. Leanne, I think I'm also an ambivert, but lean more toward introvert. I also get bored without socializing, but like you, tire quickly. At a dinner party, I'm done at the 2 hour mark, when the extroverts are just getting started. Sometimes I wish there was a graceful way to slip away, but haven't found it yet. I haven't found the "get out of jail free" card yet either Laurie - sometimes I just quietly ooze out the door when nobody is looking and then get asked where I was by someone a few weeks later - my answer "home in bed!" I am an Ambivert Leanne and have completed Myers Briggs several times but always came out as ISTJ. Some people would say I'm an extrovert but sometimes I really have to try to be social. Other times it is easy. I guess being on the cusp of Leo and Virgo doesn't help either! Anyway Ambiverts unite! I can never remember what I am in the inventory and have taken so many different inventories over the years... but I do have a good sense that I am an extroverted introvert. I guess that means you're an Ambivert too Carol - you can join our midlife Ambivert club - there will be very few rules because none of us like them! That pretty much describes me to a T! I am definitely choosing my social friends and the time I spend with them more carefully. I'm absolutely an ambivert. For years, I've been an extrovert, which is unusual for a writer, but the older I get, the more I'm ambivertish. 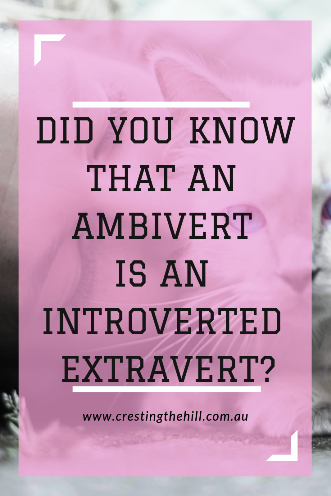 Yes, I just made up a new word, as if ambivert wasn't new enough. I really enjoy being with people, but now I need my downtime to recover. I think that's the biggest change. It bothered me at first, because I think people thought I was being unsociable when I was frequently the center of the action. But I've accepted this, and am much happier. I know exactly what you mean Kimberly - it's strange to gradually morph into a different personality type, but maybe we're just settling into the next stage of life and what fit naturally with that - and I love Ambivertish as an adjective. Welcome to the Ambivert club Leanne - I think there are a lot of us out there - happily caught somewhere in the middle! I wonder what you got too - it's quite revealing and ticked a lot of my boxes - strange to be so easily diagnosed! I couldn't agree more Kathy - I have so little time in my life for making an effort with people who I don't really want in my life- it certainly makes things more relaxing! An interesting post and one on a topic I've never heard of before. I think i must be this as I'm a bit of both in different situations. I guess that makes you an Ambivert too Angela - welcome to the club! 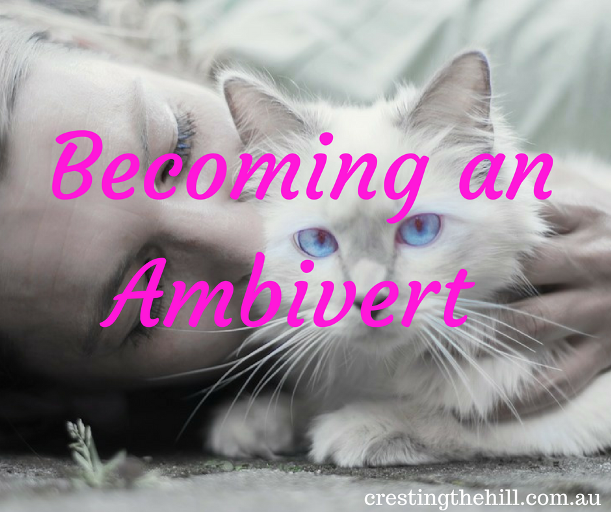 I think most of us move toward ambivert in midlife. I was always an introvert, but the friends that I've made in the last two years don't believe me when I say so! I've noticed that bloggers are a group tend towards being ambiverts - I think it's something about sharing some of yourself online that does it. Ambiverts unite!